The long and short of it: This 17 Series Dual Temperature and Pressure Shower only Faucet is a fully functioning unit which includes the Showerhead. It features a Large Handle to control the Shower (on/off) along with a smaller Handle used to set the temperature. You can set the temperature however you prefer and then just leave that smaller handle in place. Every time you take a shower you will simply turn it on with the large handle and the water come out exactly at your preferred level of warmth! Of course you can always adjust the temperature level any time as desired. This fixture also includes the required Rough-in Valve which installs in the wall. Buy this item if: You want a Shower Faucet with more precise temperature control, especially for people whose family members might disagree on a pre-set level! 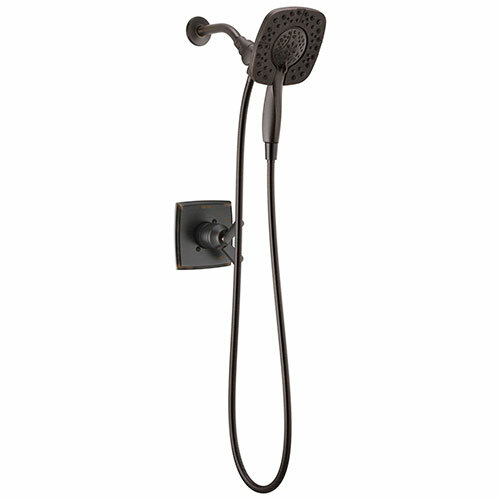 Buy this Delta Ashlyn Venetian Bronze Monitor 17 Series Shower Only Faucet with In2ition Two-in-One Hand Shower Spray INCLUDES Rough-in Valve with Stops D1137V Now!